"Sampath Speaking" - the thoughts of an Insurer from Thiruvallikkeni: ignore Sixth sense ~ does Stuart Binny deserve to be dropped !!! ignore Sixth sense ~ does Stuart Binny deserve to be dropped !!! In the Cricket crazy Nation, there are some pockets where soccer is also followed ! – Kolkata, still smarting from Brazil's loss, was preparing to cheer for Argentina, La Martiniere for Boys (LMB) wanted to make sure that there were no groggy and disappointed students in class on Monday. So the premier boys school in Kolkata declared Monday a holiday, assuming that its students would have stayed up late to watch the match. All was good till news came in that La Martiniere for Girls (LMG), their sister concern, would not be getting a similar holiday. According to The Telegraph, it is because the school decided to play by the good old gender rule-book, which is to say that girls would not be watching the largest sporting event on earth, because well they're girls - and girls don't 'do' football. Ironically, this comes on the back of a report that pointed out that the percentage of women watching football in West Bengal is way above even the world average. Turning back to our favourite game, Indian’s record on the first Test in away tests have been dismal and in that angle, the draw at Trent Bridge was good. At Lord’s in 2011, India lost by 196 runs. At Melbourne, the same year, India suffered a 122-run loss. For the draw earned now – credit is due to Murali Vijay, the centurion (and a 50); the debutant Stuart Binny and Bhuvanesh Kumar who played so well in both the innings and Sami who gave him company. 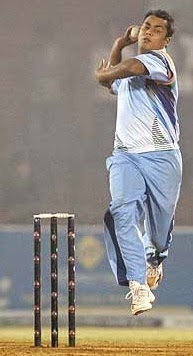 …………….but a report in TOI seem to suggest that Binny should not be playing in the next test…. !! TOI states that for a team which has historically travelled poorly and been notoriously poor starters, Indian fans should be happy after MS Dhoni’s ‘young brigade’ batted out the whole of final day to draw the first Test ; it was perhaps the only result possible on an unusually flat Trent Bridge pitch. Credit should go to Binny, playing his first Test match, as the fourth pacer in the side who can bat a bit. Bat he did, with aplomb, one must say, but it neither proved nor disproved whether the team management had made the correct decision by leaving out a frontline batsman on a lifeless track on which a fourth pacer would have been superfluous. Modern teams generally like to play with seven batsmen and four frontline bowlers in spite of complaints of excessive workload from the pace brigade. Dhoni himself has rarely ventured out of this comfort zone, and it is a pity that he chose to do so in a game where an extra batsman would have ensured a tamer draw for his side. There is no harm in being experimental, but lab chosen by the Indian team management was not ideal, for, it was the kind of pitch that did not indicate the true value of the runs scored or wickets taken. It, however, did test players’ temperament to hilt. India batted for 11 hours and 16 minutes in making 457 runs in the first innings while they were at it for 501 minutes in the second before the skippers agreed to call off the contest. From the bowlers’ point of view, the pitch simply didn’t yield any value for bending their backs. Perseverance was the key and the likes of Ishant Sharma, Mohammad Shami and Bhuvneshwar Kumar were equal to the task on a surface where the short balls bounced twice before reaching the wicketkeeper. While Indian bowlers will be certainly happy to bowl on a livelier track at Lord’s, Dhoni would be a touch worried about persisting with his five-bowler experiment. In the absence of any conclusive evidence at Trent Bridge, India’s think tank might be better off committing themselves to the “seventh sin” and play an extra batsman rather than stick to their sixth sense and rue the consequences. A more than veiled suggestion of playing Rohit Sharma leaving out the scoring Binny ! …. ,.biased it sounds ! – Binny made runs – with composure – he bowled little and is likely to succeed in English conditions….. will they write in the same vein of Ravindra Jadeja – who certainly cannot be your main spinner ! ~ and it is not as though Rohit Sharma would save every match with his batting – Binny has proved with the solitary chance and sure deserves to have more assurance in the playing XI – even as the Press pounced on his selection asserting that he is no good for Test. On the flat surface too, India was in a spot of bother before Binny steadied the boat – an interesting post in Cricinfo states that – at 3.42pm, Stuart Binny let one Moeen Ali offbreak turn past his inside edge and was given out lbw. Immediately the traffic on the player page of Andy Ganteaume came down. Ganteaume is the only man who was dropped and never picked again after scoring a debut century, although Rodney Redmondhad one hundred in one Test but he would have played again barring contact lens problems. Binny had fallen 22 short of a century on debut after four days of giving the impression India had made a selection error and were playing with 10 men only. It was a century for the taking after the match had been saved and enough time of gentle part-time spin remained, but trivia lovers had to rein in their horses. Binny played a nervous shot in the first innings to get out for 1, and then looked so innocuous with the ball he bowled only 10 overs in the innings while his role was to bowl 10 in a day. Suddenly he walked in for what the team would have looked at as the most important innings of the Test. Binny was not even playing for his place in the side, for there were no guarantees he would be retained even if he scored a hundred here !!!! Binny might or might not play ever again, but at least he will not be remembered as the selection error in a Test that India made quite a few other errors to lose to England. Binny actually took the pressure off Jadeja, who had been playing and missing regularly – there is case for his batting higher though critics would pounce stating that the quality of the innings is hard to tell on such a pitch. In one respect Andy Ganteaume, a diminutive wicketkeeper-batsman, eclipsed even Don Bradman. Whereas Bradman ended his career with a Test average of 99.94, Gunteaume's was 112. On his Test debut, against England at Port-of-Spain in 1947-48, he scored 112 and yet he never played for West Indies again. West Indies had a formidable batting line-up around this time - it was the era of Walcott, Worrell, Weekes, Sobers, Kanhai, Rae, Stollmeyer and Gomez - and there were suggestions that he slowed down when nearing his hundred, possibly costing West Indies the chance of victory. My memory took me to a Wicketkeeper batsman whose gritty 115 not out in Antigua in 2002, gave him the honour of the youngest wicketkeeper to score a Test century and the second Indian wicketkeeper to make one overseas. He was just 20 and it was only his third Test - later he lost his place in the Test side to Parthiv Patel, and in the one-day side to the appointment of Rahul Dravid as keeper in the quest for balance. He withered having played only 6 Tests. It was the 4th Test – Test no. 1602 played at St. Johns Antigua in May 2002. India opened with Shiv Sunder Das and Wasim Jaffer – runs came from Jaffer 86; Dravid 91 (Sachin made a duck) – VVS Laxman made 130 – while Ajay Ratra remained unbeaten on 115 – as India declared at 513 for 9 in 196 overs. 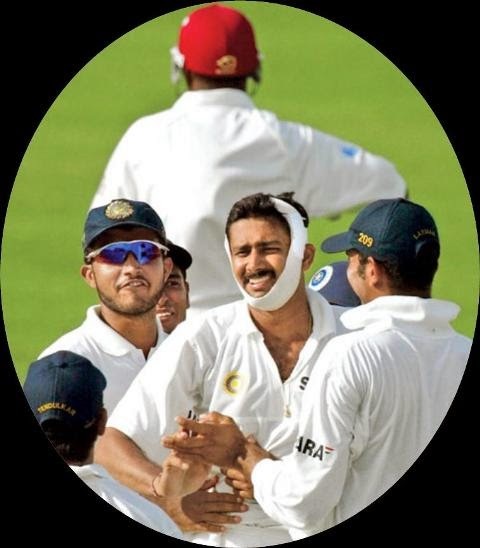 Kumble bowled 14 consecutive overs – becoming the first bowler to dismiss Brian Lara while bowling with a broken jaw. He was due to fly back to Bangalore the following day for surgery, and as he said, "At least I can now go home with the thought that I tried my best. Batting at No. 7 (Ajay Ratra at No. 8 made a century), Kumble was hit by Merv Dillon. He spat out blood but batted on for another 20 minutes. ….. towards the end, Ajay Ratra left his gloves to Rahul Dravid and bowled a solitary over – making it a statistical feat of all the 11 bolwing … that had occurred twice earlier once in 1884 at Oval and the other at Faisalabad in 1979/80 when all the Aussies bowled to Pak.